Heat oven to 350°F. Cut cookie dough into 20 slices; cut each slice in half crosswise. Shape dough into balls and roll in peanuts; place 2 inches apart on ungreased cookie sheets. Bake 12 to 14 minutes or until edges are golden brown. Immediately, with back of measuring teaspoon, make indentation in each baked cookie. Fill each indentation with heaping 1/4 teaspoon jam. Remove from cookie sheets. 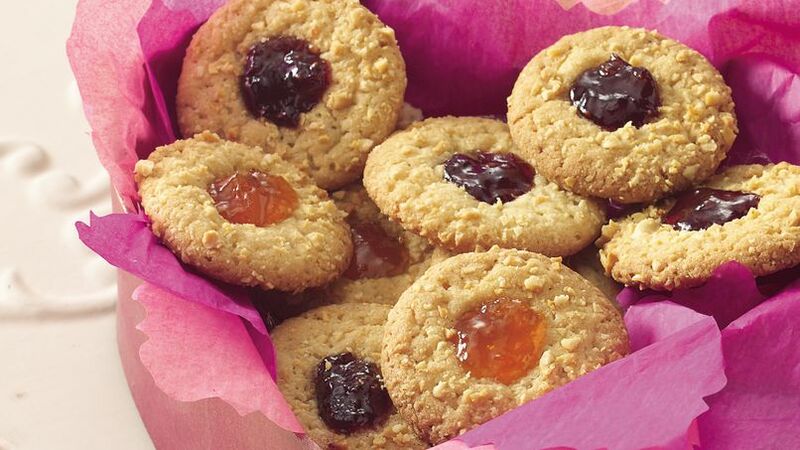 Add color to your tray of cookies by using a variety of jams or preserves as fillings for these gems. We used strawberry and apricot.